Diazepam is available as 2 mg, 5 mg, and 10 mg tablets for oral administration and contains the following inactive ingredients: anhydrous lactose, colloidal silicon dioxide; colorants: 5 mg only (D C Yellow No. 10 and FD C Yellow No. 6); 10 mg only (FD C Blue No. 1); magnesium stearate, microcrystalline cellulose, pregelatinized starch, and sodium starch glycolate. Diazepam is a benzodiazepine that exerts anxiolytic, sedative, muscle-relaxant, anticonvulsant and amnestic effects. Most of these effects are thought to result from a facilitation of the action of gamma aminobutyric acid (GABA), an inhibitory neurotransmitter in the central nervous system. After oral administration > 90% of diazepam is absorbed and the average time to achieve peak plasma concentrations is 1 to 1.5 hours with a range of 0.25 to 2.5 hours. Absorption is delayed and decreased when administered with a moderate fat meal. In the presence of food mean lag times are approximately 45 minutes as compared with 15 minutes when fasting. There is also an increase in the average time to achieve peak concentrations to about 2.5 hours in the presence of food as compared with 1.25 hours when fasting. This results in an average decrease in Cmax of 20% in addition to a 27% decrease in AUC (range 15% to 50%) when administered with food. Diazepam and its metabolites are highly bound to plasma proteins (diazepam 98%). Diazepam and its metabolites cross the blood-brain and placental barriers and are also found in breast milk in concentrations approximately one tenth of those in maternal plasma (days 3 to 9 post-partum). In young healthy males, the volume of distribution at steady-state is 0.8 to 1 L/kg. The decline in the plasma concentration-time profile after oral administration is biphasic. The initial distribution phase has a half-life of approximately 1 hour, although it may range up to > 3 hours. 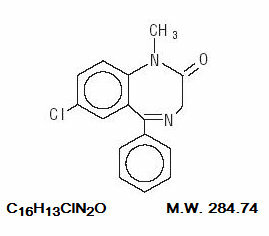 Diazepam is N-demethylated by CYP3A4 and 2C19 to the active metabolite N-desmethyldiazepam, and is hydroxylated by CYP3A4 to the active metabolite temazepam. N-desmethyldiazepam and temazepam are both further metabolized to oxazepam. Temazepam and oxazepam are largely eliminated by glucuronidation. The initial distribution phase is followed by a prolonged terminal elimination phase (half-life up to 48 hours). The terminal elimination half-life of the active metabolite N-desmethyldiazepam is up to 100 hours. Diazepam and its metabolites are excreted mainly in the urine, predominantly as their glucuronide conjugates. The clearance of diazepam is 20 to 30 mL/min in young adults. Diazepam accumulates upon multiple dosing and there is some evidence that the terminal elimination half-life is slightly prolonged. In children 3 to 8 years old the mean half-life of diazepam has been reported to be 18 hours. In full term infants, elimination half-lives around 30 hours have been reported, with a longer average half-life of 54 hours reported in premature infants of 28 to 34 weeks gestational age and 8 to 81 days post-partum. In both premature and full term infants the active metabolite desmethyldiazepam shows evidence of continued accumulation compared to children. Longer half-lives in infants may be due to incomplete maturation of metabolic pathways. Elimination half-life increases by approximately 1 hour for each year of age beginning with a half-life of 20 hours at 20 years of age. This appears to be due to an increase in volume of distribution with age and a decrease in clearance. Consequently, the elderly may have lower peak concentrations, and on multiple dosing higher trough concentrations. It will also take longer to reach steady-state. Conflicting information has been published on changes of plasma protein binding in the elderly. Reported changes in free drug may be due to significant decreases in plasma proteins due to causes other than simply aging. In mild and moderate cirrhosis, average half-life is increased. The average increase has been variously reported from 2 fold to 5 fold, with individual half-lives over 500 hours reported. There is also an increase in volume of distribution, and average clearance decreases by almost half. Mean half-life is also prolonged with hepatic fibrosis to 90 hours (range 66 to 104 hours), with chronic active hepatitis to 60 hours (range 26 to 76 hours), and with acute viral hepatitis to 74 hours (range 49 to 129). In chronic active hepatitis, clearance is decreased by almost half. Diazepam Tablets USP are indicated for the management of anxiety disorders or for the short-term relief of the symptoms of anxiety. Anxiety or tension associated with the stress of everyday life usually does not require treatment with an anxiolytic. In acute alcohol withdrawal, diazepam may be useful in the symptomatic relief of acute agitation, tremor, impending or acute delirium tremens and hallucinosis. Diazepam is a useful adjunct for the relief of skeletal muscle spasm due to reflex spasm to local pathology (such as inflammation of the muscles or joints, or secondary to trauma); spasticity caused by upper motor neuron disorders (such as cerebral palsy and paraplegia); athetosis; and stiff-man syndrome. Oral diazepam may be used adjunctively in convulsive disorders, although it has not proved useful as the sole therapy. The effectiveness of diazepam in long-term use, that is, more than 4 months, has not been assessed by systematic clinical studies. The physician should periodically reassess the usefulness of the drug for the individual patient. Diazepam Tablets USP are contraindicated in patients with a known hypersensitivity to this drug and, because of lack of sufficient clinical experience, in children under 6 months of age. It may be used in patients with open angle glaucoma who are receiving appropriate therapy, but is contraindicated in acute narrow angle glaucoma. Diazepam is not recommended in the treatment of psychotic patients and should not be employed instead of appropriate treatment. Since diazepam has a central nervous system depressant effect, patients should be advised against the simultaneous ingestion of alcohol and other CNS-depressant drugs during diazepam therapy. As with other agents that have anticonvulsant activity, when diazepam is used as an adjunct in treating convulsive disorders, the possibility of an increase in the frequency and/or severity of grand mal seizures may require an increase in the dosage of standard anticonvulsant medication. Abrupt withdrawal of diazepam in such cases may also be associated with a temporary increase in the frequency and/or severity of seizures. An increased risk of congenital malformations and other developmental abnormalities associated with the use of benzodiazepine drugs during pregnancy has been suggested. There may also be non-teratogenic risks associated with the use of benzodiazepines during pregnancy. There have been reports of neonatal flaccidity, respiratory and feeding difficulties, and hypothermia in children born to mothers who have been receiving benzodiazepines late in pregnancy. In addition, children born to mothers receiving benzodiazepines on a regular basis late in pregnancy may be at some risk of experiencing withdrawal symptoms during the postnatal period. Diazepam has been shown to be teratogenic in mice and hamsters when given orally at daily doses of 100 mg/kg or greater (approximately eight times the maximum recommended human dose [MRHD = 1 mg/kg/day] or greater on a mg/m2 basis). Cleft palate and encephalopathy are the most common and consistently reported malformations produced in these species by administration of high, maternally toxic doses of diazepam during organogenesis. Rodent studies have indicated that prenatal exposure to diazepam doses similar to those used clinically can produce long-term changes in cellular immune responses, brain neurochemistry, and behavior. In general, the use of diazepam in women of childbearing potential, and more specifically during known pregnancy, should be considered only when the clinical situation warrants the risk to the fetus. The possibility that a woman of childbearing potential may be pregnant at the time of institution of therapy should be considered. If this drug is used during pregnancy, or if the patient becomes pregnant while taking this drug, the patient should be apprised of the potential hazard to the fetus. Patients should also be advised that if they become pregnant during therapy or intend to become pregnant they should communicate with their physician about the desirability of discontinuing the drug. Special care must be taken when diazepam is used during labor and delivery, as high single doses may produce irregularities in the fetal heart rate and hypotonia, poor sucking, hypothermia, and moderate respiratory depression in the neonates. With newborn infants it must be remembered that the enzyme system involved in the breakdown of the drug is not yet fully developed (especially in premature infants). Diazepam passes into breast milk. Breastfeeding is therefore not recommended in patients receiving diazepam. If diazepam is to be combined with other psychotropic agents or anticonvulsant drugs, careful consideration should be given to the pharmacology of the agents to be employed â€” particularly with known compounds which may potentiate the action of diazepam, such as phenothiazines, narcotics, barbiturates, MAO inhibitors and other antidepressants. The usual precautions are indicated for severely depressed patients or those in whom there is any evidence of latent depression; particularly the recognition that suicidal tendencies may be present and protective measures may be necessary. The usual precautions in treating patients with impaired renal or hepatic function should be observed. In elderly and debilitated patients, it is recommended that the dosage be limited to the smallest effective amount to preclude the development of ataxia or oversedation (2 mg to 2 ½ mg once or twice daily, initially, to be increased gradually as needed and tolerated). The clearance of diazepam and certain other benzodiazepines can be delayed in association with Tagamet (cimetidine) administration. The clinical significance of this is unclear. To assure the safe and effective use of benzodiazepines, patients should be informed that, since benzodiazepines may produce psychological and physical dependence, it is advisable that they consult with their physician before either increasing the dose or abruptly discontinuing this drug. The risk of dependence increases with duration of treatment; it is also greater in patients with a history of alcohol or drug abuse. Patients should be advised against the simultaneous ingestion of alcohol and other CNS-depressant drugs during diazepam therapy. As is true of most CNS-acting drugs, patients receiving diazepam should be cautioned against engaging in hazardous occupations requiring complete mental alertness, such as operating machinery or driving a motor vehicle. If diazepam is to be combined with other centrally acting agents, careful consideration should be given to the pharmacology of the agents employed particularly with compounds that may potentiate or be potentiated by the action of diazepam, such as phenothiazines, antipsychotics, anxiolytics/sedatives, hypnotics, anticonvulsants, narcotic analgesics, anesthetics, sedative antihistamines, narcotics, barbiturates, MAO inhibitors and other antidepressants. Diazepam peak concentrations are 30% lower when antacids are administered concurrently. However, there is no effect on the extent of absorption. The lower peak concentrations appear due to a slower rate of absorption, with the time required to achieve peak concentrations on average 20 to 25 minutes greater in the presence of antacids. However, this difference was not statistically significant. In studies in which mice and rats were administered diazepam in the diet at a dose of 75 mg/kg/day (approximately 6 and 12 times, respectively, the maximum recommended human dose [MRHD = 1 mg/kg/day] on a mg/m2 basis) for 80 and 104 weeks, respectively, an increased incidence of liver tumors was observed in males of both species. The data currently available are inadequate to determine the mutagenic potential of diazepam. Reproduction studies in rats showed decreases in the number of pregnancies and in the number of surviving offspring following administration of an oral dose of 100 mg/kg/day (approximately 16 times the MRHD on a mg/m2 basis) prior to and during mating and throughout gestation and lactation. No adverse effects on fertility or offspring viability were noted at a dose of 80 mg/kg/day (approximately 13 times the MRHD on a mg/m2 basis). Category D (see WARNINGS, Pregnancy). Safety and effectiveness in pediatric patients below the age of 6 months have not been established. In elderly patients, it is recommended that the dosage be limited to the smallest effective amount to preclude the development of ataxia or oversedation (2 mg to 2.5 mg once or twice daily, initially to be increased gradually as needed and tolerated). Extensive accumulation of diazepam and its major metabolite, desmethyldiazepam, has been noted following chronic administration of diazepam in healthy elderly male subjects. Metabolites of this drug are known to be substantially excreted by the kidney, and the risk of toxic reactions may be greater in patients with impaired renal function. Because elderly patients are more likely to have decreased renal function, care should be taken in dose selection, and it may be useful to monitor renal function. Decreases in clearance and protein binding, and increases in volume of distribution and half-life has been reported in patients with cirrhosis. In such patients, a 2 to 5 fold increase in mean half-life has been reported. Delayed elimination has also been reported for the active metabolite desmethyldiazepam. Benzodiazepines are commonly implicated in hepatic encephalopathy. Increases in half-life have also been reported in hepatic fibrosis and in both acute and chronic hepatitis (see CLINICAL PHARMACOLOGY, Pharmacokinetics in Special Populations,Hepatic Insufficiency). Minor changes in EEG patterns, usually low-voltage fast activity, have been observed in patients during and after diazepam therapy and are of no known significance. Diazepam is subject to Schedule IV control under the Controlled Substances Act of 1970. Abuse and dependence of benzodiazepines have been reported. Addiction-prone individuals (such as drug addicts or alcoholics) should be under careful surveillance when receiving diazepam or other psychotropic agents because of the predisposition of such patients to habituation and dependence. Once physical dependence to benzodiazepines has developed, termination of treatment will be accompanied by withdrawal symptoms. The risk is more pronounced in patients on long-term therapy. Withdrawal symptoms, similar in character to those noted with barbiturates and alcohol have occurred following abrupt discontinuance of diazepam. These withdrawal symptoms may consist of tremor, abdominal and muscle cramps, vomiting, sweating, headache, muscle pain, extreme anxiety, tension, restlessness, confusion and irritability. In severe cases, the following symptoms may occur: derealization, depersonalization, hyperacusis, numbness and tingling of the extremities, hypersensitivity to light, noise and physical contact, hallucinations or epileptic seizures. The more severe withdrawal symptoms have usually been limited to those patients who had received excessive doses over an extended period of time. Generally milder withdrawal symptoms (e.g., dysphoria and insomnia) have been reported following abrupt discontinuance of benzodiazepines taken continuously at therapeutic levels for several months. Consequently, after extended therapy, abrupt discontinuation should generally be avoided and a gradual dosage tapering schedule followed. Chronic use (even at therapeutic doses) may lead to the development of physical dependence: discontinuation of the therapy may result in withdrawal or rebound phenomena. Rebound Anxiety: A transient syndrome whereby the symptoms that led to treatment with diazepam recur in an enhanced form. This may occur upon discontinuation of treatment. It may be accompanied by other reactions including mood changes, anxiety, and restlessness. Since the risk of withdrawal phenomena and rebound phenomena is greater after abrupt discontinuation of treatment, it is recommended that the dosage be decreased gradually. Following overdose with oral benzodiazepines, general supportive measures should be employed including the monitoring of respiration, pulse, and blood pressure. Vomiting should be induced (within 1 hour) if the patient is conscious. Gastric lavage should be undertaken with the airway protected if the patient is unconscious. Intravenous fluids should be administered. If there is no advantage in emptying the stomach, activated charcoal should be given to reduce absorption. Special attention should be paid to respiratory and cardiac function in intensive care. General supportive measures should be employed, along with intravenous fluids, and an adequate airway maintained. Should hypotension develop, treatment may include intravenous fluid therapy, repositioning, judicious use of vasopressors appropriate to the clinical situation, if indicated, and other appropriate countermeasures. Dialysis is of limited value. Dosage should be individualized for maximum beneficial effect. While the usual daily dosages given below will meet the needs of most patients, there will be some who may require higher doses. In such cases, dosage should be increased cautiously to avoid adverse effects. Diazepam Tablets USP, 2 mg are available as white, round, flat face, beveled edge tablets, debossed â€œ3925â€ and bisected on one side and â€œTEVAâ€ on the other side, containing 2 mg of diazepam USP, packaged in bottles of 100 and 500 tablets. Diazepam Tablets USP, 5 mg are available as yellow, round, flat face, beveled edge tablets, debossed â€œ3926â€ and bisected on one side and â€œTEVAâ€ on the other side, containing 5 mg of diazepam USP packaged in bottles of 100, 500, and 1000 tablets. debossed â€œ3927â€ and bisected on one side and â€œTEVAâ€ on the other side, containing 10 mg of diazepam USP, packaged in bottles of 100, 500, and 1000 tablets. GABAdone (US patent pending) capsules by oral administration. A specially formulated Medical Food product, consisting of a proprietary blend of amino acids and polyphenol ingredients in specific proportions, for the dietary management of the metabolic processes of sleep disorders (SD). Must be administered under physician supervision. Medical Food products are often used in hospitals (e.g., for burn victims or kidney dialysis patients) and outside of a hospital setting under a physicianâ€™s care for the dietary management of diseases in patients with particular medical or metabolic needs due to their disease or condition. Congress defined "Medical Food" in the Orphan Drug Act and Amendments of 1988 as "a system which is formulated to be consumed or administered enterally [or orally] under the supervision of a physician and which is intended for the specific dietary management of a disease or condition for which distinctive nutritional requirements, based on recognized scientific principles, are established by medical evaluation." Medical Foods are complex formulated products, requiring sophisticated and exacting technology. GABAdone has been developed, manufactured, and labeled in accordance with both the statutory and the FDA regulatory definition of a Medical Food. GABAdone must be used while the patient is under the ongoing care of a physician. A critical component of the definition of a Medical Food is the requirement for a distinctive nutritional deficiency. FDA scientists have proposed a physiologic definition of a distinctive nutritional deficiency as follows: â€œthe dietary management of patients with specific diseases requires, in some instances, the ability to meet nutritional requirements that differ substantially from the needs of healthy persons. For example, in establishing the recommended dietary allowances for general, healthy population, the Food and Nutrition Board of the Institute of Medicine National Academy of Sciences, recognized that different or distinctive physiologic requirements may exist for certain persons with "special nutritional needs arising from metabolic disorders, chronic diseases, injuries, premature birth, other medical conditions and drug therapies. Thus, the distinctive nutritional needs associated with a disease reflect the total amount needed by a healthy person to support life or maintain homeostasis, adjusted for the distinctive changes in the nutritional needs of the patient as a result of the effects of the disease process on absorption, metabolism, and excretion.â€ It was also proposed that in patients with certain disease states who respond to nutritional therapies, a physiologic deficiency of the nutrient is assumed to exist. For example, if a patient with sleep disorders responds to a tryptophan formulation by improving the duration and quality of sleep, a deficiency of tryptophan is assumed to exist. Patients with sleep disorders are known to have nutritional deficiencies of tryptophan, choline, flavonoids, and certain antioxidants. Patients with sleep disorders frequently exhibit reduced plasma levels of tryptophan and have been shown to respond to oral administration of tryptophan or a 5-hydoxytryptophan formulation. Research has shown that tryptophan reduced diets result in a fall in circulating tryptophan. Patients with sleep disorders frequently experience activation of the tryptophan degradation pathway that increases the turnover of tryptophan leading to a reduced level of production of serotonin for a given tryptophan blood level. Research has also shown that a genetic predisposition to accelerated tryptophan degradation can lead to increased tryptophan requirements in certain patients with sleep disorders. Choline is required to fully potentiate acetylcholine synthesis by brain neurons. A deficiency of choline leads to reduced acetylcholine production by the neurons. Low fat diets, frequently used by patients with sleep disorders, are usually choline deficient. Flavonoids potentiate the production of acetylcholine by the neurons thereby inducing REM sleep. Low fat diets and diets deficient in flavonoid rich foods result in inadequate flavonoid concentrations, impeding acetylcholine production in certain patients with sleep disorders. Provision of tryptophan, choline, and flavonoids with antioxidants, in specific proportions can restore the production of beneficial serotonin and acetylcholine, thereby improving sleep quality. GABAdone consists of a proprietary blend of amino acids, cocoa, ginkgo biloba and flavonoids in specific proportions. These ingredients fall into the category of â€œGenerally Regarded as Safeâ€ (GRAS) as defined by the Food and Drug Administration (FDA) (Sections 201(s) and 409 of the Federal Food, Drug, and Cosmetic Act). A GRAS substance is distinguished from a food additive on the basis of the common knowledge about the safety of the substance for its intended use. The standard for an ingredient to achieve GRAS status requires not only technical demonstration of non-toxicity and safety, but also general recognition of safety through widespread usage and agreement of that safety by experts in the field. Many ingredients have been determined by the U.S. Food and Drug Administration (FDA) to be GRAS, and are listed as such by regulation, in Volume 21 Code of Federal Regulations (CFR) Sections 182, 184, and 186. Amino Acids are the building blocks of protein. All amino acids are GRAS listed as they have been ingested by humans for thousands of years. The doses of the amino acids in GABAdone are equivalent to those found in the usual human diet; however the formulation uses specific ratios of the key ingredients to elicit a therapeutic response. Tryptophan, for example, is an obligatory amino acid. The body cannot make tryptophan and must obtain tryptophan from the diet. Tryptophan is needed to produce serotonin. Serotonin is required to induce sleep. Patients with sleep disorders have altered serotonin metabolism. Some patients with sleep disorders have a resistance to the use of tryptophan that is similar to the mechanism found in insulin resistance. Patients with sleep disorders cannot acquire sufficient tryptophan from the diet to establish normal sleep architecture without ingesting a prohibitively large amount of calories, particularly calories from protein. Flavonoids are a group of phytochemical compounds found in all vascular plants including fruits and vegetables. They are a part of a larger class of compounds known as polyphenols. Many of the therapeutic or health benefits of colored fruits and vegetables, cocoa, red wine, and green tea are directly related to their flavonoid content. The amounts of specially formulated flavonoids found in GABAdone cannot be obtained from conventional foods in the necessary proportions to elicit a therapeutic response. GABAdone is a yellow to light brown powder. GABAdone contains L-Glutamic Acid, 5-Hydroxytryptophan as Griffonia Seed Extract, Acetyl L-Carnitine HCL, Gamma Amino Butyric Acid, Choline Bitartrate, Hydrolyzed Whey Protein, Cocoa, Ginkgo Biloba, Valerian Root, and Grape Seed Extract. GABAdone contains the following inactive or other ingredients, as fillers, excipients, and colorings: magnesium stearate, microcrystalline cellulose, Maltodextrin NF, gelatin (as the capsule material). GABAdone acts by restoring and maintaining the balance of the neurotransmitters, serotonin, and acetylcholine that are required for maintaining normal sleep architecture. A deficiency of these neurotransmitters is associated with sleep disorders. The amino acids in GABAdone are primarily absorbed by the stomach and small intestines. All cells metabolize the amino acids in GABAdone. Circulating tryptophan and choline blood levels determine the production of serotonin and acetylcholine. GABAdone is not an inhibitor of cytochrome P450 1A2, 2C9, 2C19, 2D6, or 3A4. These isoenzymes are principally responsible for 95% of all detoxification of drugs, with CYP3A4 being responsible for detoxification of roughly 50% of drugs. Amino acids do not appear to have an effect on drug metabolizing enzymes. GABAdone is intended for the clinical dietary management of the metabolic processes in patients with sleep disorders and sleep disorders associated with anxiety. Patients taking GABAdone have demonstrated significant functional improvements when this therapeutic agent is used for the dietary management of the metabolic processes associated with sleep disorders. The administration of GABAdone results in the induction and maintenance of sleep in patients with sleep disorders. GABAdone has no effect on normal blood pressure. GABAdone is contraindicated in an extremely small number of patients with hypersensitivity to any of the nutritional components of GABAdone. Oral supplementation with L-tryptophan or choline at high doses up to 15 grams daily is generally well tolerated. The most common adverse reactions of higher doses â€” from 15 to 30 grams daily â€” are nausea, abdominal cramps, and diarrhea. Some patients may experience these symptoms at lower doses. The total combined amount of amino acids in each GABAdone capsule does not exceed 400 mg.
GABAdone does not directly influence the pharmacokinetics of prescription drugs. Clinical experience has shown that administration of GABAdone may allow for lowering the dose of co-administered drugs under physician supervision. There is a negligible risk of overdose with GABAdone as the total dosage of amino acids in a one month supply (60 capsules) is less than 25 grams. Overdose symptoms may include diarrhea, weakness, and nausea. Post-marketing surveillance has shown no serious adverse reactions. Reported cases of mild rash and itching may have been associated with allergies to GABAdone flavonoid ingredients, including cinnamon, cocoa, and chocolate. The reactions were transient in nature and subsided within 24 hours. For the dietary management of the metabolic processes in patients with sleep disorders. Take (2) capsules daily at bedtime. An additional dose of one or two capsules may be taken after awakenings during the night. As with most amino acid formulations GABAdone should be taken without food to increase the absorption of key ingredients. GABAdone is supplied in blue and white, size 0 capsules in bottles of 60 capsules. GABAdone is a Medical Food product available by prescription only and must be used while the patient is under ongoing physician supervision. Store at room temperature, 59-86OF (15-30OC) Protect from light and moisture. GABAdone is supplied to physicians in a recyclable plastic bottle with a child-resistant cap.